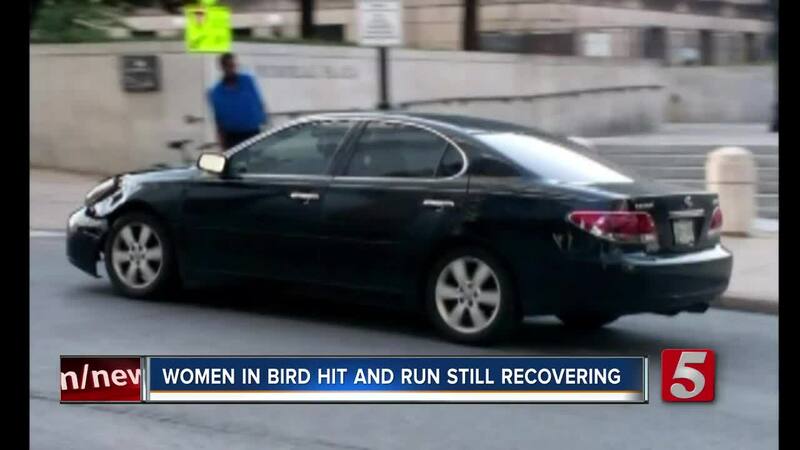 After five months, family members of one of two women seriously injured on Bird scooters when a car struck them question why an arrest hasn't been made. Lindsey Cowan and Rachel Johnson were both severely injured when they were hit by a black Lexus sedan in the intersection of Union Street and Fifth Avenue North on May 13. Witnesses told police the car then fled the scene of the wreck. Cowan and Johnson were both taken to the hospital and Johnson was originally not expected to survive. According to a collision report from Metro Nashville Police, an investigating officer was able to locate the Lexus in the back yard of a Madison home. When he talked with a person living in the home, the resident said the car belonged to his wife's son, James Reagon Jr. The report states the car was covered up with plastic and tape. While police were at the home, Reagon Jr. returned and refused to answer question from police and said he needed to talk with his lawyer first. The car was impounded by police and tests are being done on it. Cowan's father, Peter Hilger, said he doesn't understand why Reagon Jr. wasn't arrested and charged. "So, my daughter today, after basically five months [is] finally back to work," said Hilger. "She just got released from the orthopedic area on October 11th. She'll permanently have metal rods all up and down her right leg. Very limited nerve feeling in her left and right ankles." Hilger said it's obvious that Reagon Jr. was the driver because his father told police he was the only driver of the Lexus, according to the report. Lab work is being down on the car to discover who put the tape and plastic over the car. If it comes back with Reagon's finger prints and DNA, there could be tampering with evidence charges. Hilger said he's considering hiring his own detective to investigate the crash.